EVANSTON, Ill. — A Northwestern University-led international team is getting closer to understanding the mysteriously bright object that burst in the northern sky this summer. On June 17, the ATLAS survey’s twin telescopes in Hawaii found a spectacularly bright anomaly 200 million light years away in the Hercules constellation. Dubbed AT2018cow or “The Cow,” the object quickly flared up, then vanished almost as quickly. After combining several imaging sources, including hard X-rays and radiowaves, the multi-institutional team now speculates that the telescopes captured the exact moment a star collapsed to form a compact object, such as a black hole or neutron star. The stellar debris, approaching and swirling around the object’s event horizon, caused the remarkably bright glow. Margutti will present her findings at the 233rd meeting of the American Astronomical Society at 2:15 p.m. PST on Jan. 10 in Seattle. (Reporters can join the session to watch, listen and ask questions via webcast.) The research will then be published in the Astrophysical Journal. Margutti is an assistant professor of physics and astronomy in Northwestern’s Weinberg College of Arts and Sciences and a member of CIERA (Center for Interdisciplinary Exploration and Research in Astrophysics), an endowed research center at Northwestern focused on advancing astrophysics studies with an emphasis on interdisciplinary connections. For one, the anomaly was unnaturally bright — 10 to 100 times brighter than a typical supernova. It also flared up and disappeared much faster than other known star explosions, with particles flying at 30,000 kilometers per second (or 10 percent of the speed of light). Within just 16 days, the object had already emitted most of its power. In a universe where some phenomena last for millions and billions of years, two weeks amounts to the blink of an eye. Using Northwestern’s access to observational facilities at the W.M. Keck Observatory in Hawaii and the MMT Observatory in Arizona, as well as remote access to the SoAR telescope in Chile, Margutti took a closer look at the object’s makeup. Margutti and her team examined The Cow’s chemical composition, finding clear evidence of hydrogen and helium, which excluded models of compact objects merging — like those that produce gravitational waves. Astronomers have traditionally studied stellar deaths in the optical wavelength, which uses telescopes to capture visible light. Margutti’s team, on the other hand, uses a more comprehensive approach. Her team viewed the object with X-rays, hard X-rays (which are 10 times more powerful than normal X-rays), radio waves and gamma rays. This enabled them to continue studying the anomaly long after its initial visible brightness faded. After ATLAS spotted the object, Margutti’s team quickly obtained follow-up observations of The Cow with NASA’s Nuclear Spectroscopic Telescope Array (NuSTAR) and INTEGRAL hard X-ray laboratories, soft X-rays at XMM-Newton and radio antennae at the Very Large Array toward The Cow. 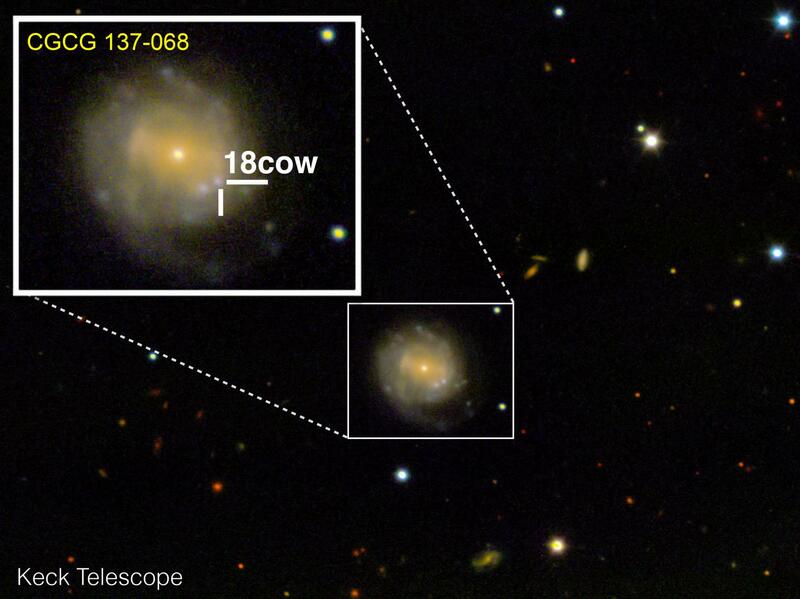 Margutti attributes The Cow’s relative nakedness to potentially unraveling this intergalactic mystery. Although stars might collapse into black holes all the time, the large amount of material around newly born black holes blocks astronomers’ vision. Fortunately, about 10 times less ejecta swirled around The Cow as compared to a typical stellar explosion. The lack of material allowed astronomers to peer straight through to the object’s “central engine,” which revealed itself as a probable black hole or neutron star. Margutti’s team at Northwestern includes graduate student Aprajita Hajela, postdoctoral fellows Giacomo Terreran, Deanne Coppejans and Kate Alexander (who is a Hubble Fellow), and first-year undergraduate student Daniel Brethauer. The research was made possible by Swift, XMM-Newton (soft X-rays and ultraviolet), NuSTAR, INTEGRAL (hard X-rays), SoAR, Keck I, Keck II, Magellan, WIYN, SMARTS (optical), United Kingdom Infrared Telescope, MMT Observatory (near infrared), Very Large Array and Very Large Baseline Array (radio). Margutti’s team was partially funded through NASA (XMM-Newton AO-17, program number 82258) and through Hubble Fellowship grant NSGHF2-51373. The Keck and part of the MMT Observatory observations were supported by Northwestern University and CIERA.